2 Bronze Elixir Integrated Brandcomm Pvt. Ltd. Covestro Beats Elixir Integrated Brandcomm Pvt. 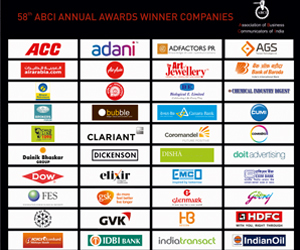 Ltd.
8 Gold AGS Transact Technologics Ltd. AGSTTL Newsletter-Banking & Fintech AGS Transact Technologics Ltd.
7 Gold IndianOil Corporation Ltd. (Southern Region) International Women's Day IndianOil Corporation Ltd.
1 Bronze Elixir Integrated Brandcomm Pvt. Ltd. Cafeteria Illustrations Elixir Integrated Brandcomm Pvt. Ltd.
2 Silver Indian Transact Services Ltd. ITSL – India Indian Transact Services Ltd.
3 Silver HB Design Pvt. Ltd. The Gharanas of Hindustani HB Design Pvt. Ltd.
2 Bronze ACC Limited Muskaan ACC Ltd.
1 Bronze Tata Power - Delhi Distribution Ltd. Don’t Waste Bijli Tata Power - Delhi Distribution Ltd.
4 Bronze Dow Chemical International Pvt. Ltd. Industry Intelligence Dashboard Dow Chemical International Pvt. Ltd.
6 Silver Praddictability Media Sciences Pvt. Ltd. Discover Praddictability Media Sciences Pvt. 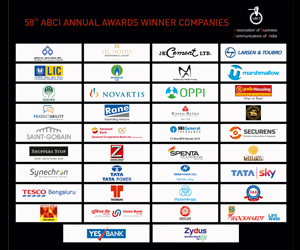 Ltd.
3 Silver J.K.Cement Ltd. Corporate Film AICL Communications Ltd.
4 Silver Wockhardt Ltd. Happiness Wockhardt Ltd.